There are plenty of companies that are offering free web hosting services. One may think that they are all the same and that it is just a matter of choosing one. But this is far from the truth. How important is what they are offering free to you? Is there an opportunity to upgrade if necessary? What kind of support are you being offered? During this review of the seven best and the most popular free web hosting companies, these three factors will be considered along with the extras that each of the company has to offer. It is also important to consider the “must haves” and the “nice to haves” in a free web hosting service. This hosting company offers a fairly comprehensive free hosting service compared to many of the others. This company is totally upfront with what they have to offer for free and take pride in the fact that there are no hidden costs. They believe that their free hosting program out shines some of the paid versions. No matter how good your site is, if it’s not live on the web then it is not going to serve any purpose. The uptime here is 99% which is the top average for all good hosting sites including those with the paid versions. The disk space is the amount of space that you are being allotted on the host’s server where your files for your website will be stored. If the amount that you are given is too small then it will limit the site of your website. This free hosting service is allowing for a very impressive 1,000 mb disk space. The bandwidth is going to have a direct impact on how your site is able to handle the traffic to your site. 000Webhost is giving you 10GB of bandwidth, which is usually more than enough for the average website owner. The average website demands about 5GB of bandwidth. Not only are you getting free hosting for one domain but you are getting it for two. This allows you to have two full-sized websites up and running and being hosted for free. There is the provision of monthly backups for the free hosting accounts. For those starting up a website, this is usually enough. Perhaps the most significant downside for this free hosting package is their support which they provide via community forum only. However, everything else being offered on the site is extremely user-friendly. Here are some of the highlights of the extra features that come with 000webhost. One of the most important aspects of a free hosting provider is the ease of use with their services. This hosting company has made sure that each of the free features is user-friendly. They have focused on essential features like for those that want to have WordPress sites. To be able to achieve this it is done through the one-click auto installer. Another important feature is the FTP which is the file transfer protocol system. This allows for easy file management. Remote connections can easily be made to any FTP client. Many website owners want to be able to monetize their sites but this can be difficult if the free hosting version they are using utilizes ads in their features. 000Web Hosting does not do this. Their free platform is ad-free and there is the opportunity for those using this to monetize their site the way the way they want to. Site security is becoming a big concern for site owners as well as visitors. This hosting company is one of the first to offer SSL security as part of their free offerings. Every site is protected with an SSL certificate. Not only does this provide extra security but search engines recognize it which means it can help to improve search engine rankings. Most new website owners don’t start with the knowledge of how to design and build their website. 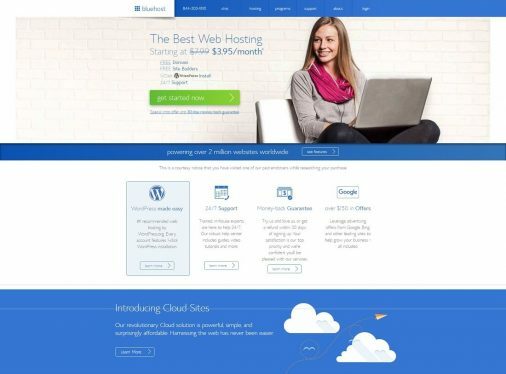 000Web Host has made this easy with a drag and drop website builder. There is no coding to learn. 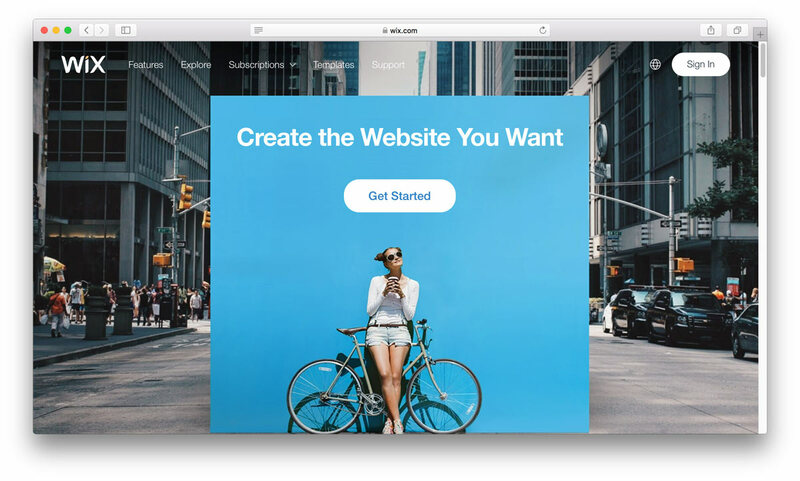 The builder provides a variety of easy to use tools that will let the beginner develop a website to their liking. Although the free version here at 000webhost has everything that a new site owner needs to get started, there may come a time where the free version is outgrown. When this happens this hosting company offers two potential upgrades with some additional important must haves and features. Larger disk space, bandwidth, number of websites that can be hosted. 000Webhost really does excel in the importance of the 6 important must haves when it comes to website hosting. Then all of the other nice to have features each play an important role in enhancing the functionality of the site which is a big bonus. Although the free offerings are extensive the ability to be able to upgrade at two different levels is another important aspect about this site. The only area where 000webshost may score low is that there is no support in the free version. 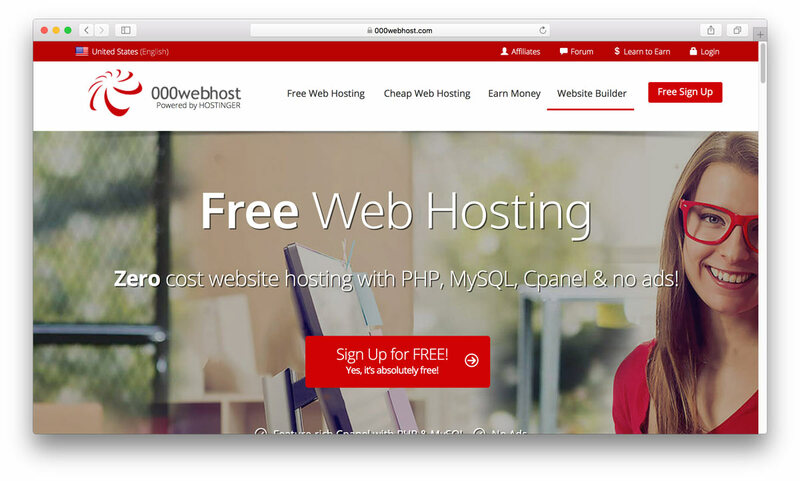 Overall 000Webhost has to take our first position for being the best free web hosting service. This company is offering a free hosting service because they know that every new web owner needs a good start. They believe that by supporting them that they will become well established on the web, and will eventually require paid hosting services. When they do they feel confident that this once upon a time free hosting users will convert to their paid plans. 5GB doesn’t give any indication what their specific uptime is. Although it would be safe to assume that they are going to be on par with their competitors which means it would be around 99.% of the time. The company is providing 5 GB of space which should be enough to service the average website. It should serve those who want to use a lot of images or do some streaming. 5GB free is offering more disk space compared to 000Webhost but less that Free Hosting. One of the strongest features of this free hosting package is that it allows significantly more bandwidth compared to some of the others reviewed here. 5 GB free is allowing for free hosting of one domain. This may be enough for most as once they get a site established and want to have more they can upgrade to one of the paid packages. This free hosting service does not indicate whether they provide a backup service for the free hosting plan that they offer. There is limited support available here at 5GB free. It is through the forums. Although this is not the ideal support, there is a lot that can be learned through the forums. Here are some of the highlights of the extra features that come with 5GB Free Hosting. the owner’s website for them to be able to transfer files. For those that want to do some coding then there is the opportunity for new web builders to advance their skills a little, which again gives them greater control over personalizing their site. With the offering of 3 of these it allows for web owners to do a lot more organizing and compiling of their data. 5 GB Free is offering all of the important components listed as the must haves, although it doesn’t clearly indicate the uptime. Its strong point is the large amount of disk space. It is a little weaker in the allowance of domains compare to some of the others. There is no indication for backups. There are some great features added to the upgrades along with the expansion of the volume for the free services. Although forum support is not the best support it is better than nothing. Overall, 5 GB Free is a solid free hosting service that is able to meet the important needs of the site owner. There are choices in the extra features although not as expansive as what 000Webhost has for example. Based on all of the 5GB Free Hosting holds our second position. 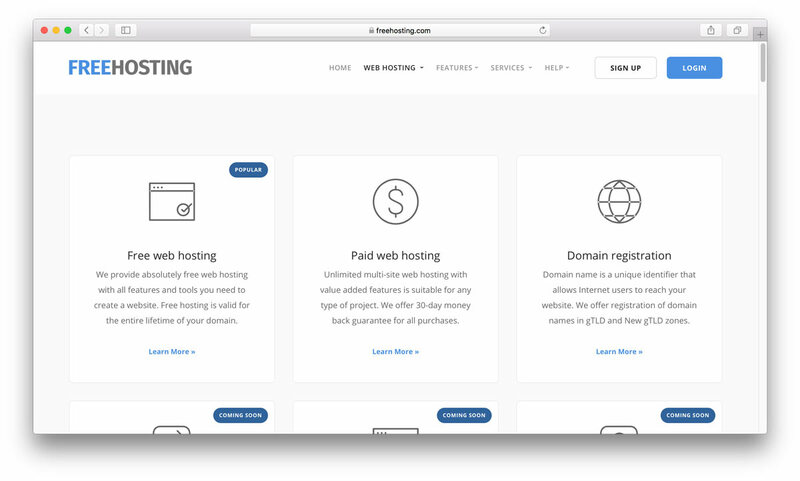 FreeHosting is very clear about what they do offer, as well as what they do not offer. This gives the users of their free hosting services a clear understanding of what they have to work with. Free Hosting has not indicated their uptime. Again, it can be assumed that they would be equal to their competitors and be somewhere between 99% to 99.9%. Although they do say you site will be online 24 hours a day. The strong feature of Free Hosting is their significant allowance of 10 GB of disk space. This is well beyond what the average site would require at least until they were well established. With this amount of disk space it will not be likely that the web owner would have to upgrade any time soon based on the volume of their content. Is unmetered which means that there is no emphasis or limit put on the amount data that goes back and forth between the site and the server. Free Hosting is going to allow for the hosting of one domain at no cost under their free plan. This hosting site has not given any clear indication as to what they provide for backup. Free Hosting is not indicating that they provide any type of support for those that are using their free hosting services. Free Hosting offers some nice to have features that are not only for convenience but also for those who want to advance beyond the basics of a website start up. The site builder offered by free hosting is basic but user friendly. There is no design knowledge needed or coding skills. It basically is comprised of over 170 templates that can be chosen from, and then content added as required. This is rather a unique feature that a lot of free hosting sites are not offering. It is a totally automatic feature with over 400+ applications that can be chosen from. Some may consider that this should be a must have, but there are other options for setting up outside email accounts so it doesn’t need to be put into the must have category. It really is a nice to have feature based on convenience. All of the must haves are accounted for, and when it comes to the extra features there may not be as many as some of the other free hosting sites. But, there are some unique ones like the apps installer. Also, the convenience of one email. One difference with this company is that the upgrades are not offered in packages. Each upgrade is offered with individual pricing. Some clients like this because they are only going to be paying for what they are going to use. The downside is no support for the free version of hosting here at Free Hosting. But, there is excellent hosting in the upgraded version. Free Hosting has everything that the new web owner wants and needs for hosting their website free. It has earned the 3rd sport in our rankings for best free web hosting. 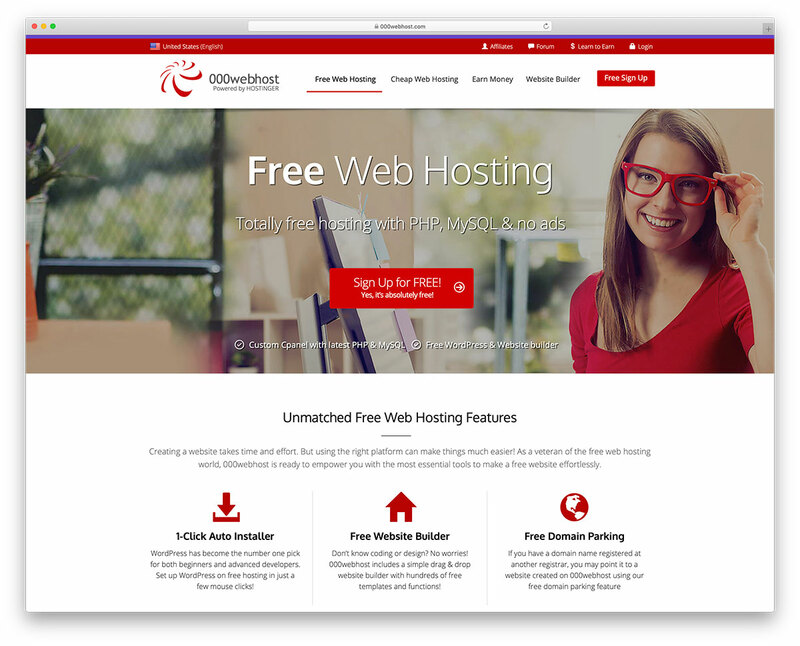 Freehostia uses a different platform for their hosting services including the free versions. They are relying on load balanced cluster technology which they are promoting as being fifteen times faster than a standard hosting server. Even with this new technology this hosting company is committing to 99.9% uptime. 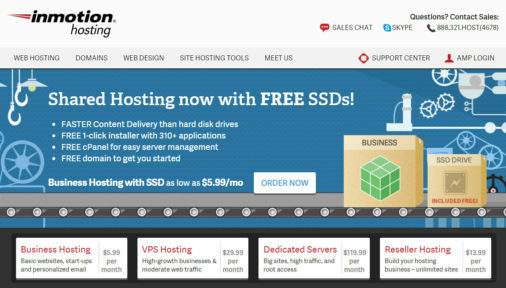 This free hosting site is offering 250 MB of disk space. This is about double what the average web site uses which is about 150MB. An average web page usually demands about 1 to 2 MB. Freehostia offers 6 GB which isn’t a lot compared to the others. Some experts indicate that the majority of websites won’t use anymore that 5GB of bandwidth a month. 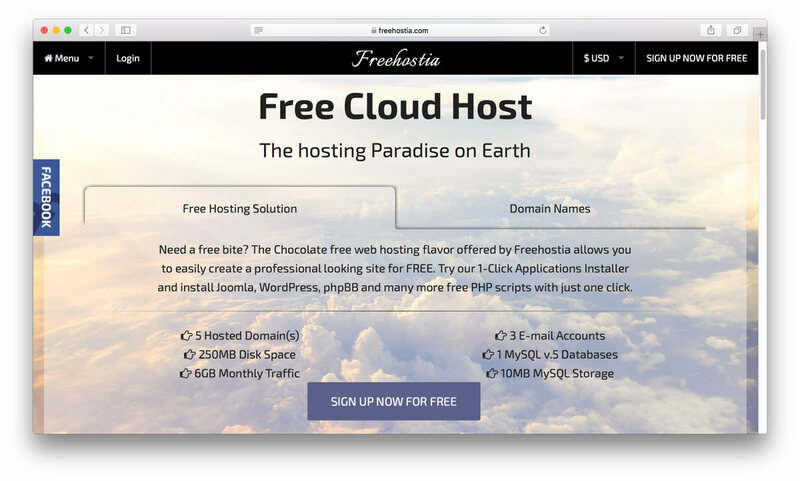 Freehostia is offering their free hosting in what they call the Chocolate package. They don’t specifically say how many domains they will host for free but they do say domains as well as subdomains. The free hosting package does indicate that the hosting has the capacity for backups but does specifically indicate how often this is done. Freehostia offer a full support program that is quite impressive for a free hosting offer. The list of the nice to have features that are offered by Freehostia is long and impressive. Perhaps the basic web owner at least in the beginning will not use to its fullest extent. But, they are still nice to have so the option is there. Not every free hosting company offers a control panel but this company does and they have focused on making it user-friendly. More importantly, the control panel has been designed to be multi-lingual which means a lot more people can use and understand it. What may appear as simple tasks when building and maintaining a website can sometimes be a challenge. For many of these Freehostia has provided the solution with the one-click free applications installer which allows for easy installation of blogs, content management and even an e-shop portal. The 3 most important metrics overviewed. Most of what is being offered for free even in the nice to haves is significant because it allows a new website to grow while exposing the site owner to many of the features that can be used to scale up a website. This way they become familiar with these features and know how to work with them if and when the need arises to upgrade. Freehostia offers several upgrade packages. Each of them increases what the package below them has to offer then adds a few extras to it. This type of tier upgrades allows for good affordability, as the cost of hosting only increases as the website grows. Support is listed in one of the must haves but is something that is lacking in many of free hosting plans. The exception to this is at Freehostia which offers full support as well as a variety of different types of support starting from the free plan all the way through to each of the paid plans. Freehostia is ideal for both the beginner and the novice web owner who wants to rely on having their needs met through free hosting. This site has earned the fourth position in our rating. AwardSpace wants to stay competitive with the other quality hosting companies so they too have a free hosting program. They have focused on keeping it simplified and user-friendly. Plus, they have also focused on making the move to paid versions affordable. Award Space is prepared to offer free hosting that is going to allow for uptime of 99.9% of the time. This is important, as a website that is not accessible is of no value. 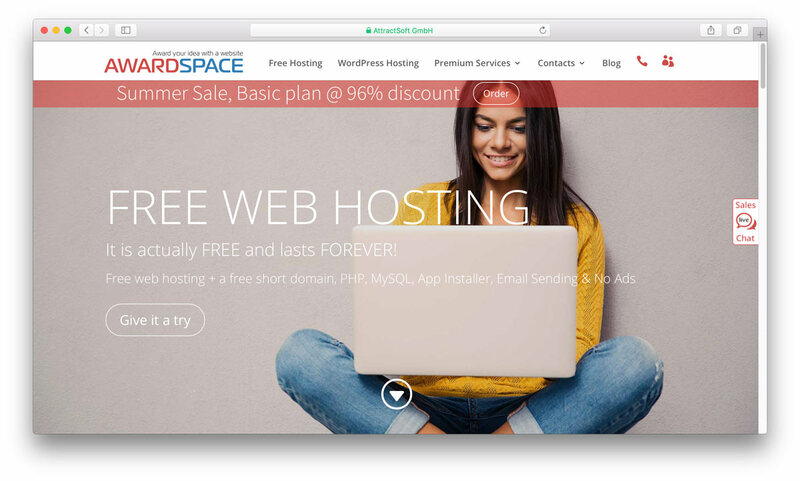 The 1 GB of disk space being offered in the free version of hosting at Award Space is lower compared to others but is enough to support a decent sized and average website. AwardSpace is on par with the bandwidth capabilities that they are offering for free users which is 5GB. It is lower than some of the others but most find it efficient. The free hosting program here allows for one domain. You can also have three subdomains. The majority of those that are starting into a web presence want to start with one site and get it established. Having the option to have some additional subdomains allows for greater site expansion without having to start new sites. Award Space does not indicate whether or not they provide backups or if they do how often it is. This is one of the few free hosting sites that also includes full support for their free hosting users. Many web owners want to have extensions to their sites and the easiest way to do this is with subdomains. AwardSpace will allow for 3 sub domains. The upgrade being offered by AwardSpace are available in different packages. In addition to these packages, Awardspace also offers paid plans for Word Press sites that are basically the same as the other paid version plans. 3 metrics that matter overviewed. This company is offering 24/7 customer support even for their free plan which is an excellent offering and is considered to be a must-have. AwardSpace is allowing for some flexibility with the different features and tools it offers to its free hosting users. It has earned the fifth spot with us here. There is a major difference with Weebly in comparison to many of the free hosting companies. Their focus is on providing the technical platform needed to have a website live on the internet. They provide a selection of the components that a website needs to be able to function on the web. Then as a secondary convenience, some of the free hosting programs will offer a web building application or at least some tools to use for this or ready-made templates. Weebly has basically reversed their priorities. They put more emphasis on promoting the components needed for building and designing the website. The technical aspects for getting and keeping the site live are there and are free of charge but they are more behind the scenes and are not made the focus for the free hosting offering. With Weebly providing the free hosting they are not advertising their Uptime but they will be on par with any of the other hosting company. They are well spoken of when it comes to fast load speeds. The program is allowing for a decent sized site to be built and maintained. It does this with the provision of offering 500MB of storage. For those that are running a basic site this is enough to keep more site owners happy. There again is no focus on band width as it is taken for granted based on the disk space that is being provided for disk space that there will be more than enough bandwidth to accommodate everyone. 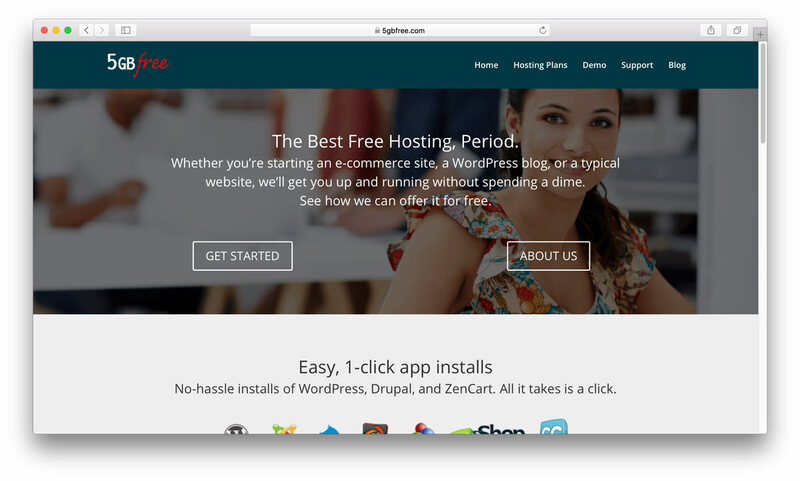 There does not appear to be a limit as to how many domains one can host for free at Weebly. Being as the technical platforms are being maintained in the back end and the bigger focus is on encouraging clients to design and develop their websites. There is a drawback with the domains feature on Weebly as they are sub domains with the free version. With the infrastructure that Weebly works off of backups are automatically created of each individual site. It does not indicate how often. Weebly has a help centre that can be accessed form the user’s website interface. The contact options are email and live chat. Those that are members of the Pro plan or higher can also access live phone support. The website builder is the big drawing point of the Weebly free hosting. It comes with a lot of options and a lot of tools. It is extremely user-friendly with its drag and drop building program. One of the big concerns on the internet today is security for both web owners as well as the users of the site. Weebly offers SSL security for its free hosting plan which is not something that a lot of the others do. There are also e-Commerce Versions of these Paid Plans. Summarizing the 3 metrics that matter most. The must haves are there and the site owner really doesn’t have to be concerned about them if they are building an average sized site. For the free features they are somewhat limited but one of the important ones which is the site builder is a good one that is user-friendly and has a lot of options. The opportunity to upgrade focus most on the expansion of the size of the site but one of the important differences is that the paid versions are free of ads which is not the case with the free version. There is support access even for those using the free hosting services. Overall for those who really don’t want to get into the technical requirements of what a website needs to go live then Weebly is a good choice. By going with this free type of free hosting it means having some restriction when it comes to expanding the capabilities of the site. The two major drawbacks with the free hosting version is the Weebly ads and only being able to have a Weebly sub domain. We have placed Weeby in the sixth position for our ratings. 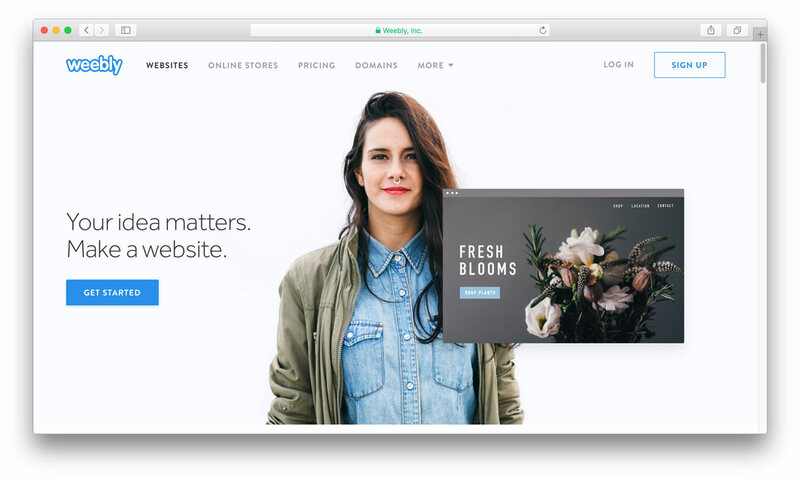 Wix is very much along the same lines as Weebly meaning the focus they create is more on their clients building and designing their website using simplified tools provided for them to do this. The technical components of what the site needs are automatically looked after by Wix themselves which is the must haves. Although the uptime is not advertised it can be assumed that Wix is going to be just as good as the other free hosting sites for keeping the sites they are hosting live. There is plenty of disk space with the 500 MB that Wix is offering in their free hosting package. The average website will work quite nicely with this, even if they are using a number of images and a fair amount of pages. Bandwidth is important for downloading and streaming. But with 1GB of bandwidth, there should not be any issues. The one downside here when it comes to domains is that only a subdomain running off the Wix domain is allowed for the free hosted sites. The infrastructure that Wix has in place will tend to the backups. Wix has an extensive self-help center to assist all users of the Wix platform no matter whether they are using free hosting or paid plans. With the focus being on making it easy for the web owner to design and build their site then the website builder is going to be important. Wix has made sure that they are going to have the perfect plan for everyone. To meet these needs they have developed 5 different paid plans that range in price. There are an additional two plans that are structured for e-commerce sites. Overviewing the 3 metrics that matter. The must haves are all here and the extra features are limited but the big one which is the web builder is a great one offering many different templates to choose form and build out. With five plans being available to upgrade there should not be any reason for members to have to leave Wix because they aren’t being accommodated. The help centre is extensive but there is no real actual contact that can be made so one needs to hope they are going to find their answers in the centre. Wix is on par with Weebly and it really is going to come down to which website builder you prefer and which one has more extra features that you feel would be beneficial. Wix has our seventh spot in our ratings. Here we have chosen seven out of many free hosting sites. We have made our choices based on set criteria based on the must haves but other important components such as ease of use and options for upgrading. Keep in mind that free web hosting is an excellent started for making a presence on the web. But, there is a lot of competition that most sites are faced with. In order for the website to excel the best choice for hosting is paid hosting which is going to offer more features, faster load times and better opportunities to grow the site.